Little buddha head charm is made of sterling silver and dangles from a bead that has a 4.5 mm hole and little hearts around the bead ring. It also has a rubber stopper so that the charm does not move around (this can be removed if desired to allow free movement). You can add this charm to necklaces, anklets or bracelets to make your own buddha jewelry. The 4.5 mm size is compatible with 3 mm chain bead charm jewelry systems (like Pandora and Troll). 1 cm + 1 cm bead, 2.9 g.
A portion of our profits is donated to the Tibetan Children’s Education Foundation (TCEF), an organization dedicated to the preservation of Tibetan culture in exile. To donate to TCEF directly or sponsor a child please visit TCEF's website . Please contact us before sending us return. Little om mani padme hum charm is made of sterling silver and dangles from a bead that has a 3mm hole and little hearts around the bead ring. It also has a rubber stopper so that the charm does not move around (this can be removed if desired to allow free movement). Om mani padme hum is the buddhist mantra of compassion. You can add this charm to necklaces, anklets or bracelets to make your own om mani padme hum jewelry. The 4.5 mm size is compatible with other bead charm jewelry systems (like Pandora, Troll and Chamilia). The 3mm snake chain bracelet is made of sterling silver. It is perfect for use with our charmas good karma BEADS collection. You can use it as a base and buy whichever bead charms you like. Change them out based on your mood and add to your collection as you like. 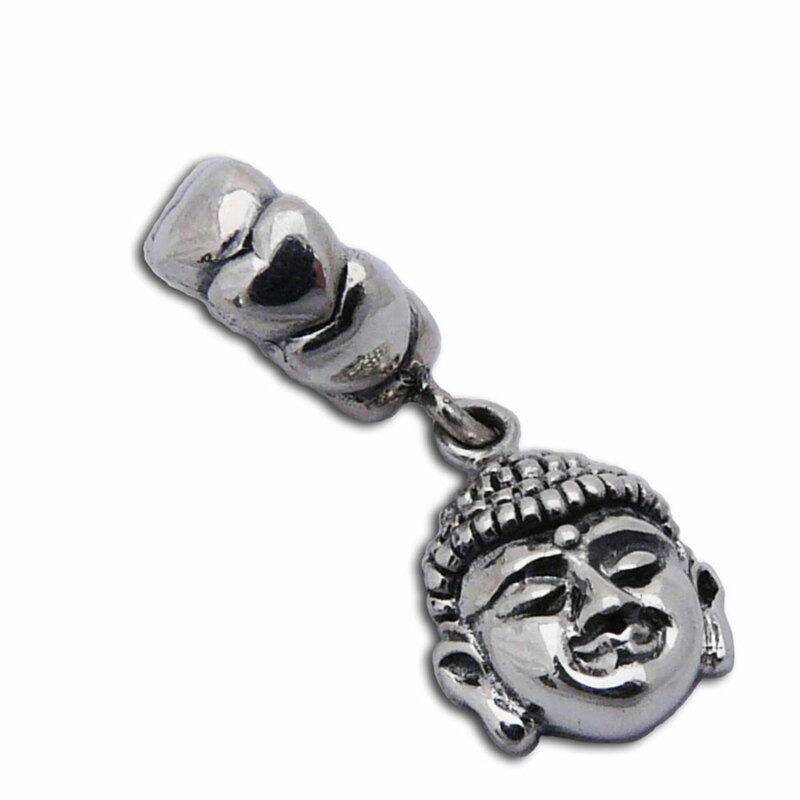 Sterling silver buddha portrait charm. This tiny pendant is part of shanti boutique's charmas line. It is a 1.5 cm charm with a lobster clasp to make it easy add to your charm bracelet or necklace.